2 cup greens - spinach, romaine, kale, etc. Place Quinoa in a fine strainer and rinse it a few times under cool water or it can be bitter. Bring broth to a boil then stir in quinoa. Reduce heat to low, cover and let simmer for 15 minutes. While quinoa is cooking, reheat Roasted Vegetable Meal Prep onions and peppers. Make dressing. Mix hummus, vinegar, oregano, salt, and pepper. Add water until desired consistency. Remove from heat and let stand covered for another 5-10 minutes. Fluff quinoa with a fork. Reserve half and allow to cool to room temperature. Store in airtight container in refrigerator until ready to use. 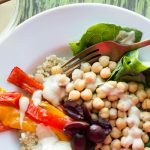 To assemble: In 2 bowls, layer greens, quinoa, beans, artichoke hearts, peppers, onions, kalamata olives, top with dressing and serve.